Are contractor license bonds the same as contract bonds? What percentage do I need to pay? How can I decrease my contractor bond cost? Can I get bonded if I have a low score? What happens if a claim is filed? Construction contractors are generally required to be registered or licensed with their state or local authorities, and a contractor license bond is often required in the process. The contractor license bond is a type of surety bond, which, in essence, is an agreement between three parties: the principal (the contractor), the obligee (the entity requiring the bond, usually the state), and the surety (the bond provider). A contractors license bond acts as a guarantee that you will comply with all regulations imposed by your local authorities. It is like a line of credit for your business, providing extra protection for your customers that you will fulfill your work fully and diligently. There are other construction-related bonds such as bid, performance and payment bonds, but they are different from a contractor license bond. The license bond concerns general compliance with the statutes of your license, while the other three types of bonds are posted for work on a specific project. Contract bonds serve as a guarantee that you will follow your contractual obligations under a specific project, such as completing your work, or paying your subcontractors or suppliers as agreed. 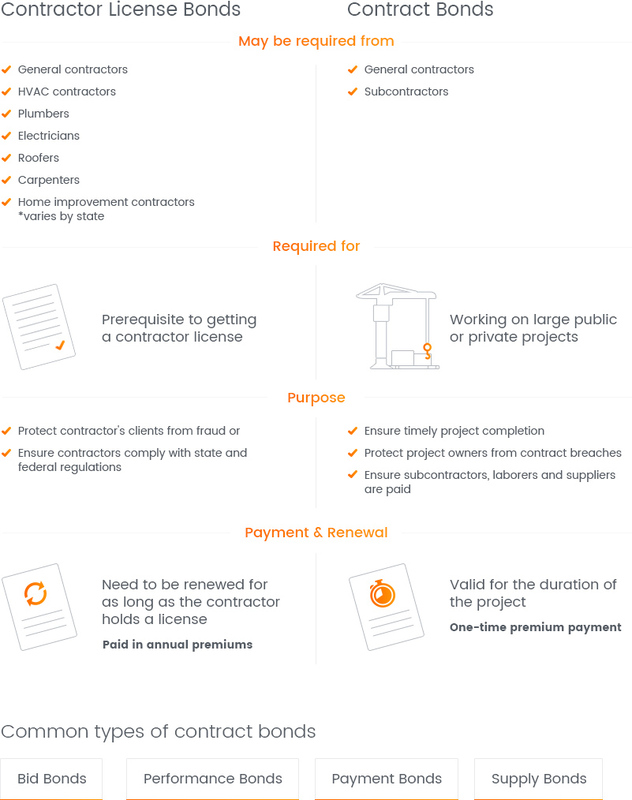 You can learn more about the difference between contract bonds and contractor license bonds if you take a look at the infographic at the bottom of the page. In the following sections, you can learn more about how much it costs to get this type of bond, how you can get bonded, and what a bond claim is. 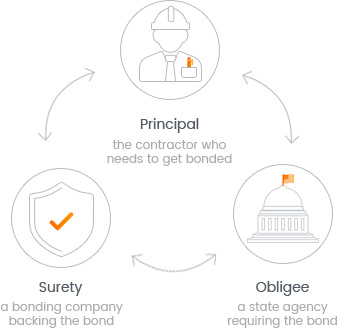 For basic information about surety bonds, see our expert "What is a surety bond" guide! If you want to find out more about state or local bonding requirements for contractors, you can do so by selecting your state below. If your overall condition is good, you’ll have to pay less. Additionally, each state and local authority has different requirements regarding the bond amount. If you have a high credit score, around or above 700 FICO, the cost for your contractor license bond, or the bond premium, is usually between 0.75%-2.5% of the total amount. For example, if you’re required to post a $10,000 contractor license bond, you might pay between $100 and $300. Get an estimate of the cost of your bond from our bond calculator below! Your credit score. The higher it is, the lower you’ll pay. Your overall financial status. Showcase strong financial statements and good liquidity. Your choice of surety bond provider. For many contractors with lower credit score or past bankruptcies, tax liens or court cases, getting bonded can seem difficult. But actually, getting bonded with bad credit is not that difficult at all! The only significant difference for such applicants is that bond premiums for them are a bit higher, in the range of 5%-10%. But by improving their credit score over time such applicants can receive increasingly better rates on their bonds. To start your bonding process, complete our bond form. We’ll soon get in touch with you to provide you with a free quote on your bond! You can also call us at (866)-450-3412 if you need assistance with your application. Bond forms vary across states and municipalities; make sure you get the right one from your local authorities. Once you get the completed bond, we recommend that you make a copy for yourself before submitting it to the relevant authorities. You can also look for your bond in the table below! If you breach the contractor surety bond agreement, this may give rise to a surety bond claim! A claim can be due to non-compliance with state or local regulations, using fraudulent business methods, failure to declare and pay your taxes, etc. Bond language and forms vary by location, so you need to be well aware of the ones required in your place (or places) of operation. In the event of a claim, there are several possible courses of action. You can seek an out-of-court settlement, which is usually recommended if you know that you have breached the bond agreement and will lose the claim in court anyway. A settlement will generally be less costly and time-consuming and will not hurt your reputation the way a claim will. Alternatively, you can try and go to court over the claim. If that is your preferred option, you need to make sure that you have sufficient and well-documented evidence to present. Communication with the claimant should be well-documented too, and at every step of the claim process. Finally, it is advisable that you notify the company that issued your contractor license bond. After you present your case in front of the surety, they can decide to intervene in your favor and offer legal aid in court. If you lose your court case, your will have to financially compensate the claimant up to the full penal sum of the bond. These two types of bonds are frequently confused, so we created a short infographic to explain the difference.